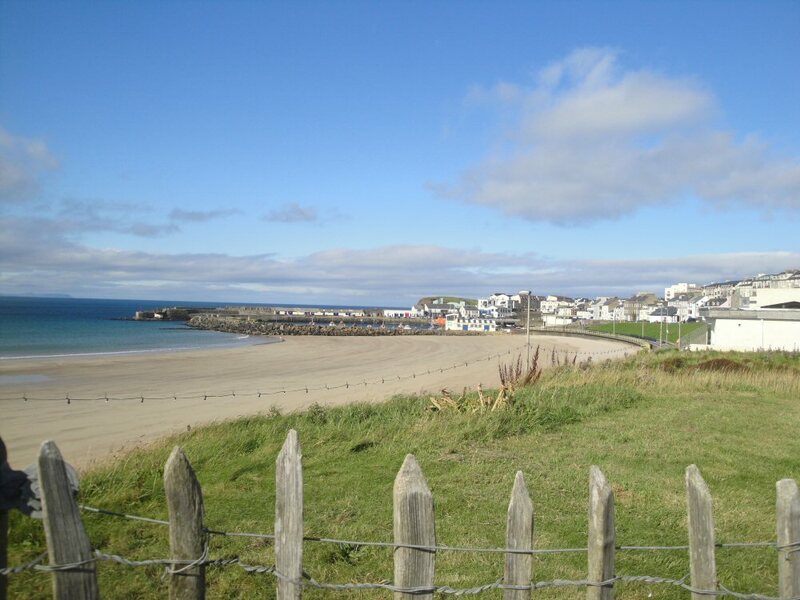 We arrived in Portush, Northern Ireland, on a nice warm and sunny afternoon. 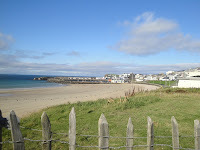 I was amazed at being this far north and finding a beach town that apparently is booming during the summer months. Who knew it would be that warm this far north? We kept hearing about the Gulf Stream reaching up in this direction but didn't realize just how much it affected the climate and water temperature. Lunch was in a cafe we found along the main street of town. Again, the waitress was fascinated with us being Americans and choosing to visit Northern Ireland. Her only warning was, "Be careful in Belfast." 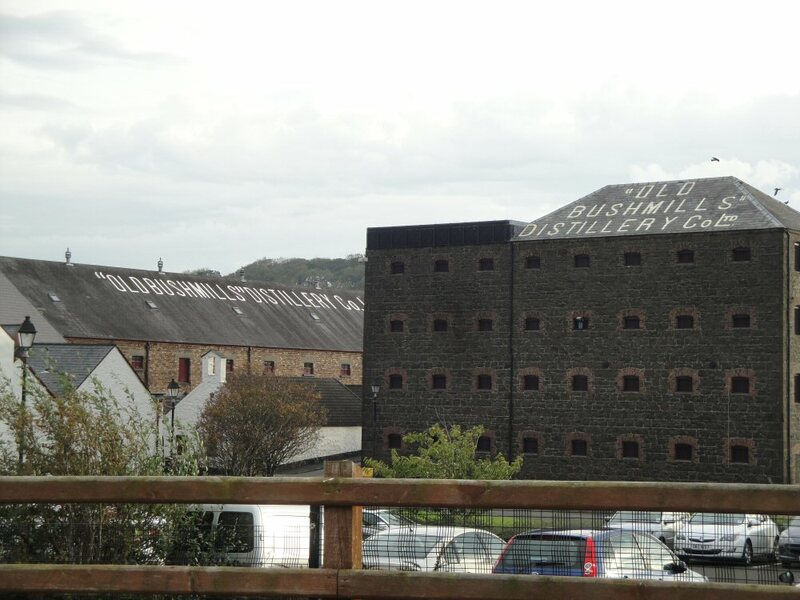 Derry was a pleasant enough experience. Wouldn't Belfast be too? A little later we met some folks enjoying the sun from a park bench. They, too, thanked us for coming to Northern Ireland and were hopeful more tourists would venture north now that things were quiet. We wandered the to wn a bit on a wild goose chase trying to find the TI which was actually marked by a large fake lighthouse that we could see but didn't know that was the TI. We passed the amusement park now closed for the season and ended up at the shore near a park area. Bob and I decided to explore the hill and see what kind of a view we could get. 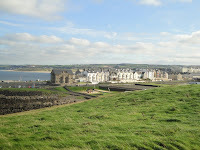 At the top of the cliff was a sign that declared this to be Ramore Head--which means Big Ring Fort. Another ring fort? If so, this one had little left of the stones that had once been the fort. The sign also told us that we could see the hills of Donegal to the west--check. And the islands of Scotland to the north--not so clear. The two of us soaked in the view and the sun for a few minutes and then headed back down. Our little tour group of four decided to take it slower the next couple of days. We had been spending lots of time in the car and it felt good to be in the wider open spaces of outdoors and our roomy B&B. Good thi ng because the next afternoon it rained so much that we spent it indoors in front of a wide screen TV watching--football? Rugby actually. We found it amusing that the rain did not deter the golfers on the course across the street from us. The morning had started out all right, a bit damp but doable. 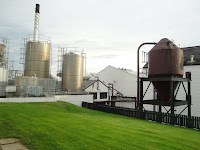 We trekked off to the Bushmills Distillery to learn h ow Irish whiskey is made. 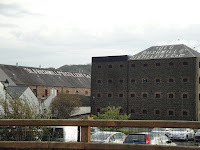 Just as they had at the Guinness Storehouse, the end of our tour included a tasting of whiskey. I asked for the mildest flavor, sipped it, choked, wiped tears from my eyes, and totally remembered why I didn't like whiskey of any kind. 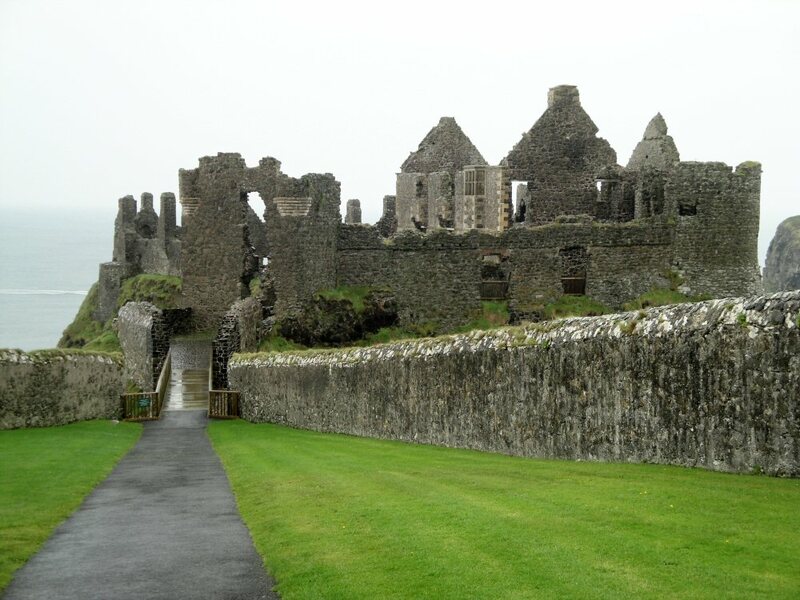 A ways down the road was another castle on our list to visit--Dunluce. It was probably the largest of all the medieval castles we'd seen so far although it wasn't in as great a shape. 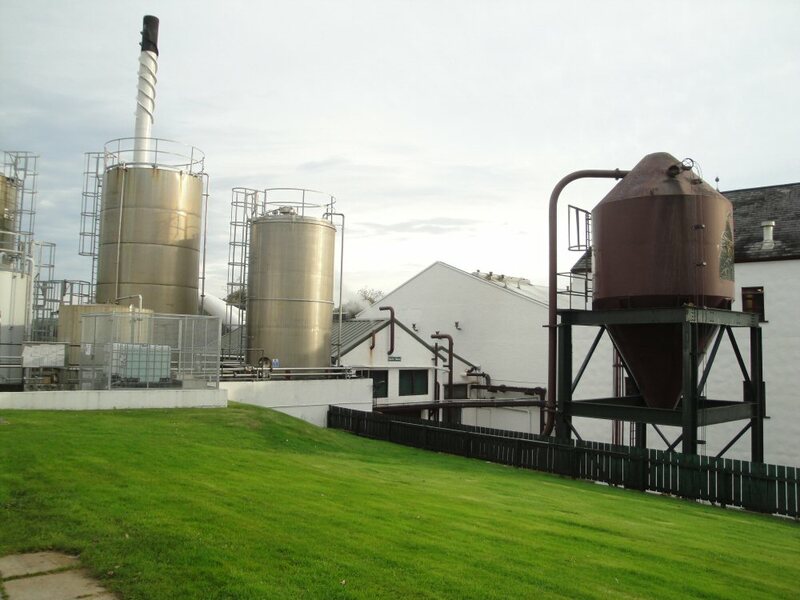 Some of it dates back to the 16th century to the original owners, the MacQuillans. Notice that it is a Scottish name. 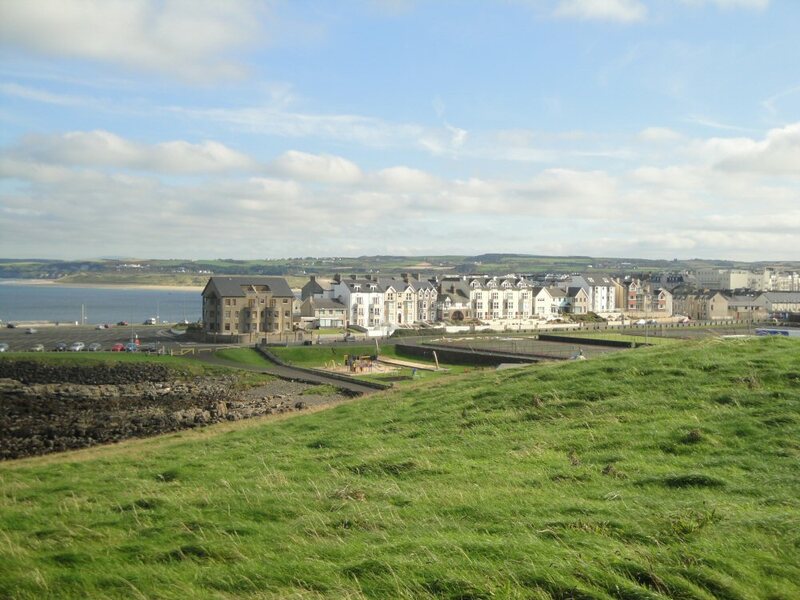 This area of Northern Ireland is very close to Scotland. If you go to this site for the castle, you'll find a virtual tour (it's on a sunny day!) 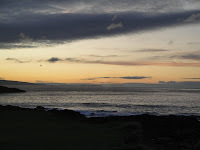 and if you click for the Panorama view, as it pans across the water, in the distance you can s ee what I believe are the islands of Scotland. 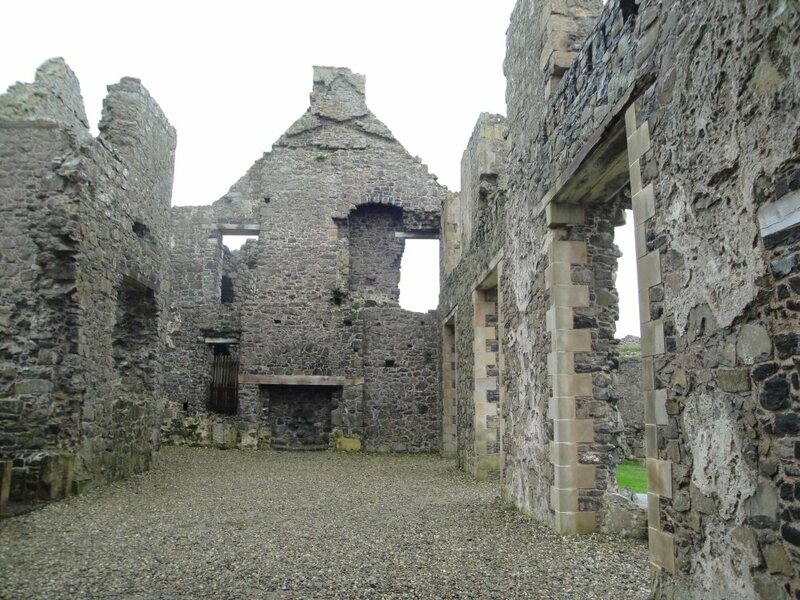 Much of what survives was built by the next owners in the 17th century, the MacDonnell clan. 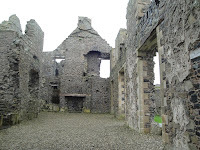 They loved to entertain and the improvements they made to the castle centered on that . There is a large guest house that you pass by before going across a small bridge that leads to the main quarters where guests were entertained and the family lived. Since the castle sits right on the cliff's edge which is continually wearing away from the elements of wind and water, it has lost some of its mortar and stone. 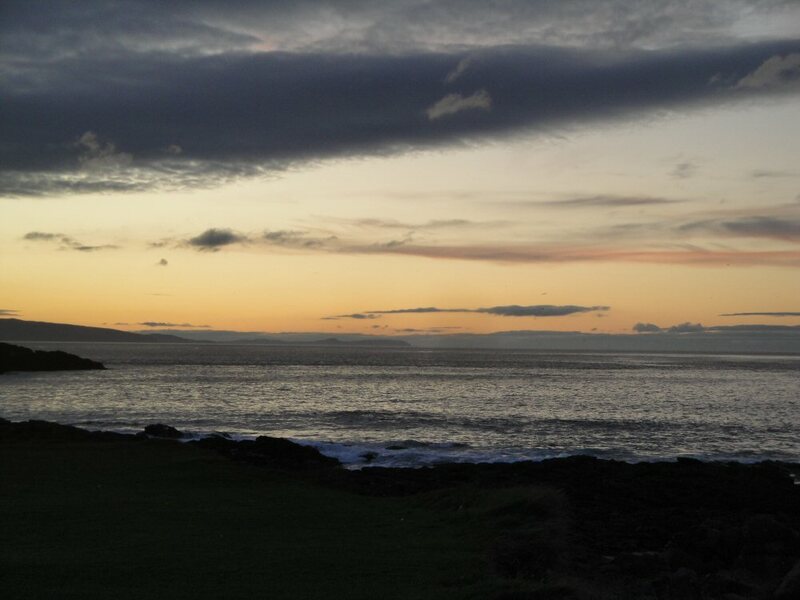 Legend has it that one night the kitchen with all of its servants fell into the ocean and that was why the countess of Antrim packed up and moved inland. 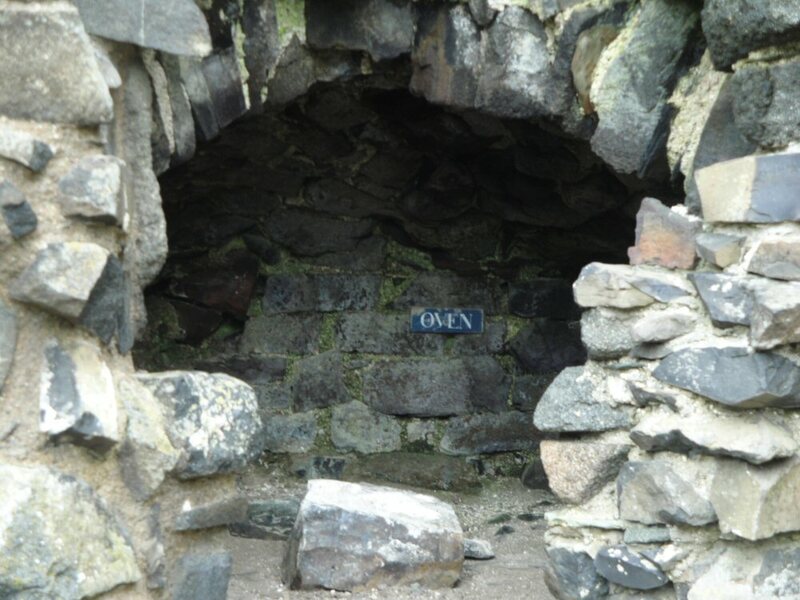 Perhaps, but there is still a large fireplace-like space marked "oven" in what appears to be the castle's kitchen. One look at that and I am so much more appreciative of my microwave.